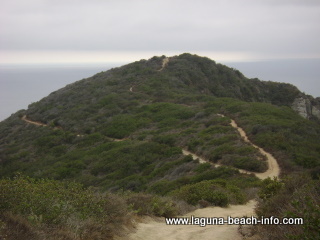 Aliso Peak Hiking Trail should definitely be on your list of things to do while you’re in Laguna Beach! 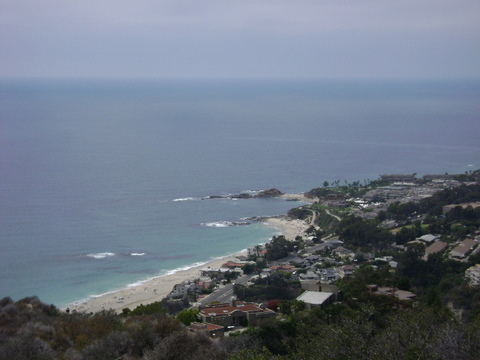 Even at a mere 683 feet, Aliso Peak offers the BEST VIEWS of the Laguna coastline and Aliso Beach. Although, the Aliso Peak Hiking Trail, is a bit misleading. The actual trail is very short, only a few hundred yards long, as it extends from the intersection where the Valido, Toovet, and St.Tropez Trails all converge. Once you’ve gotten to the crossroads of these trails, you’ve already put in the hard work, and the trip to this panoramic peak is easy. The last section includes a steep wood-tie staircaise to get you up to the pinnacle of Aliso Peak Hiking Trail where the best views of Laguna Beach, possibly all of Orange County will unfold. This is a view of Aliso Peak from the base of the St.Tropez Trail. The Aliso Peak Trail cuts along the right side, and you can clearly see Toovet Trail along the left side of Aliso Peak. 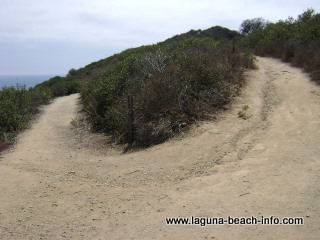 This is where Toovet Trail (on the left) meets the Aliso Peak Trail (on the right). A short hike up the hill, will lead you to some amazing views of the coastline! To get to Aliso Peak, follow the directions posted on the Valido Trail page. Hike to the top of Valido Trail and turn left. At the fork between Toovet Trail and the Aliso Peak Trail stay right, and you'll find yourself enjoying the stunning views of Aliso Peak! !